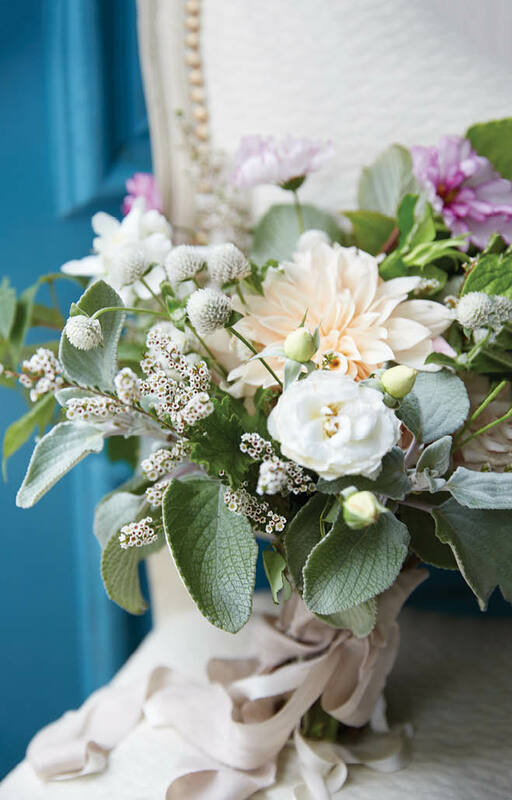 For this super-sweet bouquet, A Day in Provence expertly combines Café au Lait dahlias, Quicksand roses, gomphrena, cosmos, calycina, ranunculus, mock orange, scented geranium and dogwood with raspberry, silver shield and gardenia foliage. The arrangement is wrapped with hand-dyed silk ribbon by local artist Shasta Bell. See the world through rose-colored glasses. 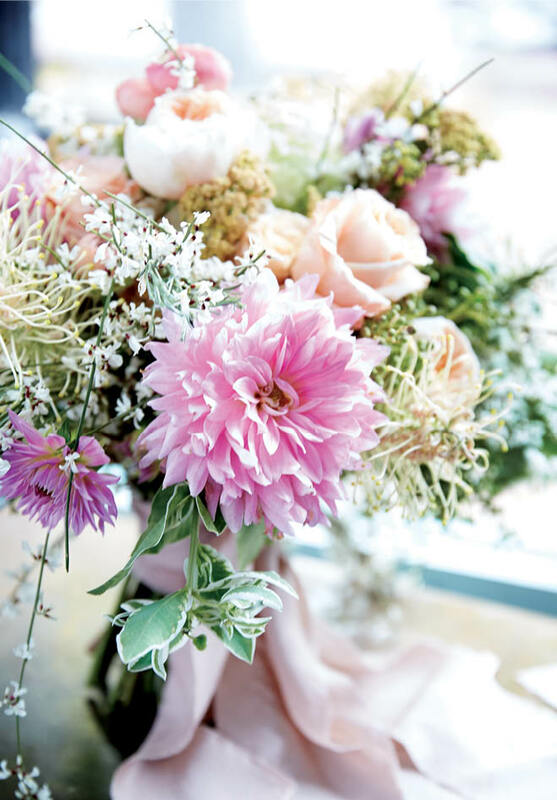 This pretty-in-pink bouquet by Studio C Floral pairs vibrant bubblegum dahlias with paler blooms like cinnamon roses, Pee Gee hydrangea, privet, ginestra, cottage yarrow, grevillea Spiderman and snow on the mountain, to stunning effect. An asymmetrical centerpiece by Festivities adds a cool, contemporary focal point to your table. Spiral eucalyptus, pearl acacia, veronica and tillandsia provide elegant structure, softened by white and blush blooms like ranunculus, garden roses, hydrangea and lisianthus. Walk down the aisle with major style. 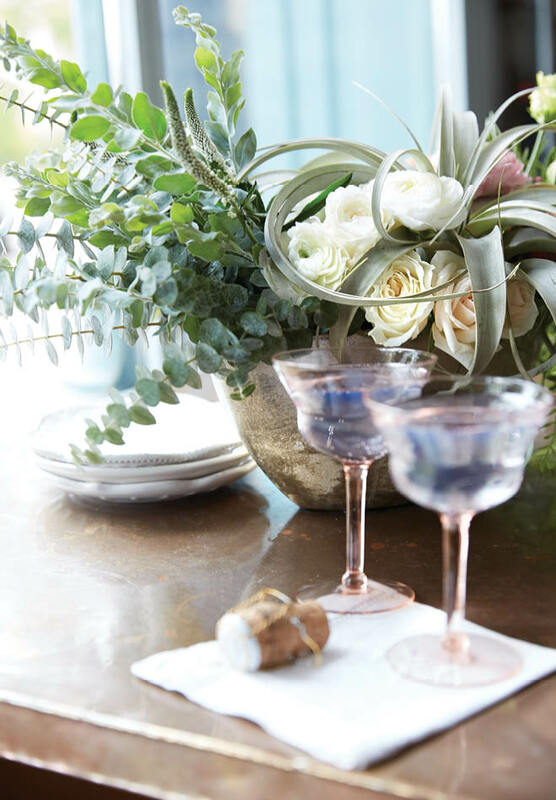 Here, Haute Flower Boutique creates a secret garden setting. 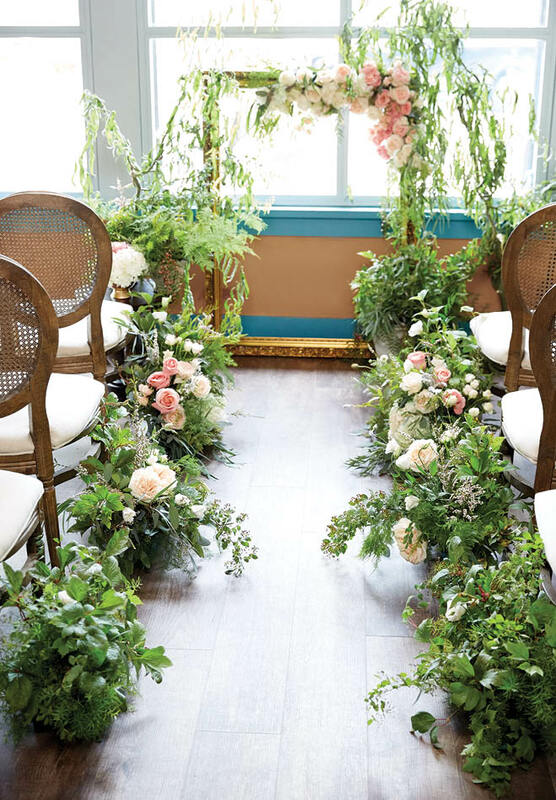 An aisle runner arrangement of myriad greens gathers blooms of garden roses, spray roses, lisianthus and hydrangea as you proceed down the path to a ceremony framed by a cascade of florals and fresh-cut curly willow branches. Guests take in the striking setting from elegant cane-back chairs from Rudy’s Event Rentals. How divine to dine at a table as glam as this. 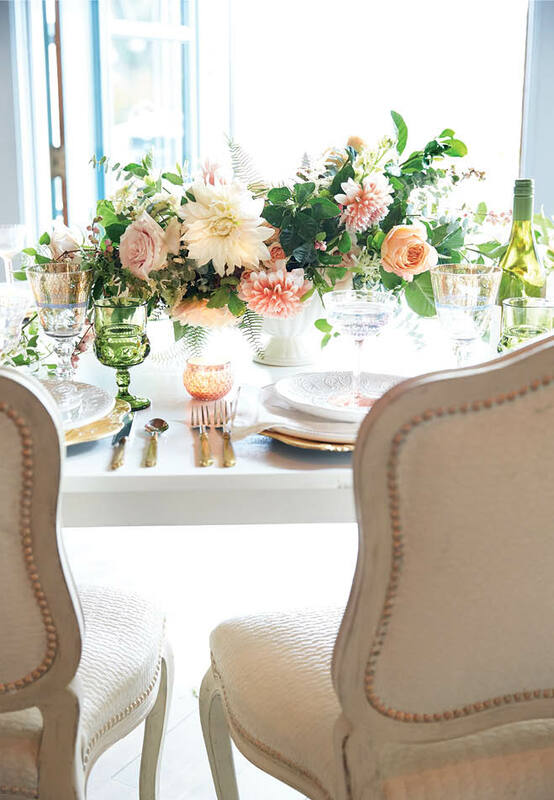 Luxe rentals from Rudy’s Event Rentals—vintage glassware, textured china and French-inspired chairs in shades of ivory—are accompanied by an ultra-dreamy centerpiece of Café au Lait dahlias, Caramel Antike garden roses, astilbe and foliage by Bloom Designs. Floral installations are going green. Here, Munster Rose artfully arranges an array of lush foliage, including Boston fern, asparagus fern, bird’s nest fern and smilax, for a brilliant botanical backdrop. 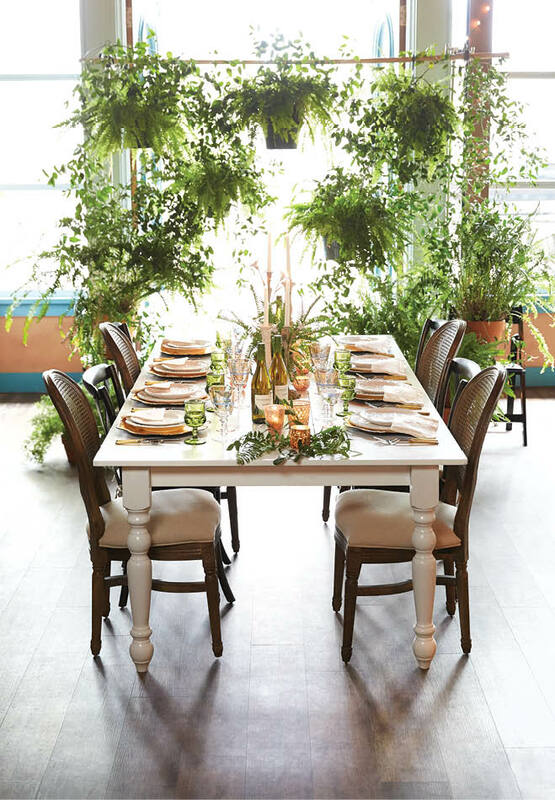 The green theme carries over to a summery tablescape, set by Rudy’s Event Rentals, featuring coordinating centerpieces and peridot-hued cut-glass stemware.